Λέσβος, ένα καταπράσινο Αιγαιοπελαγίτικο στολίδι τοποθετημένο στην Β.Α. πλευρά του πελάγους, ένας επίγειος παράδεισος με διάσπαρτες ιαματικές πηγές και αμέτρητες ιδιόμορφες ακρογιαλιές που αφήνουν τον επισκέπτη άναυδο από την τελειότητα του σχήματος τους και τα καθάρια κρυσταλλένια νερά τους. Ένα κομμάτι γης που κόπηκε από την Μικρασία για να απομακρυνθεί μέσα στα γαλανά νερά του Αιγαίου, ένα καταστολισμένο με λουλούδια καράβι, όπως την χαρακτήρισε ο Στρατής Μυριβήλης, που πλέει ανέμελα στο πέλαγος είναι η Λέσβος το νησί των 1630 Km2, τρίτο κατά σειρά μετά την Κρήτη και την Εύβοια. Τα χιλιάδες στρέμματα ελαιώνων σε συνδυασμό με τα απέραντα πευκοδάση δίνουν το ασημοπράσινο χρώμα στο νησί με το σχήμα πλατανόφυλλου όπως το περιέγραψε χαρακτηριστικά και ο Οδυσσέας Ελύτης. Το νησί τελεί και γενέτειρα γη πολλών σπουδαίων ονομάτων των τεχνών και των γραμμάτων, ξεκινώντας με το φιλόσοφο Θεόφραστο, τον κιθαρωδό Αρίων, την Σαπφώ και τον Αλκαίο, τον Πιττακό έναν από τους 7 σοφούς που η μορφή του αποτυπώθηκε σε πολλά νομίσματα φτάνοντας στον μέγα ζωγράφο Ιακωβίδη τον νομπελίστα Ελύτη και άλλους πολλούς που έγραψαν ιστορία. Λέσβος, η πριγκίπισσα του Αρχιπελάγους, με την πανάρχαια ιστορία, την πατροπαράδοτη φιλοξενία και την απαράμιλλη ομορφιά, μαγεύει τον επισκέπτη όπως οι σειρήνες και τον παρασύρει σε κόσμους μαγικούς. Νησί του ήλιου και της έμπνευσης, του μύθου και της ιστορίας, έχει όλα τα χαρακτηριστικά που θα κάνουν τις διακοπές σας να σας μείνουν πραγματικά αξέχαστες. Οι φίλοι του ούζου, θα χαθούν στη μυρουδιά του, οι φυσιολάτρες θα μαγευτούν από τα τοπία και τις εναλλαγές του γαλάζιου με το πράσινο, της θάλασσας με το βουνό και οι υποστηρικτές της παράδοσης θα γνωρίσουν ένα τόπο αναλλοίωτο στο χρόνο. Από τη βουερή σιωπή της ακροθαλασσιάς ως το μοναχικό τραγούδι γυμνών ξέφωτων, ζωσμένων από μύριες μυρωδιές : αλμύρα, φρεσκοκομμένη ελιά, θυμάρι και μοσχολίβανο απ' τα σπαρμένα στην ύπαιθρο ξωκλήσια…. Σε τούτη τη Γη, δεν θα μπορούσε παρά ν' ανθίζει το πάθος για την δημιουργία, για την ίδια την ζωή… Κάθε στιγμή του χρόνου, η Λέσβος προσφέρεται απλόχερα στον επισκέπτή της, να τη χαρεί και να τη θαυμάσει. Δεν είναι μόνο για το καλοκαίρι. Την άνοιξη, το φθινόπωρο, ακόμη και το χειμώνα, χαρίζει μοναδικές στιγμές χαράς και νοσταλγικές μνήμες στον επισκέπτή της. The Bay of Kaloni and in particular the beach town of Skala Kaloni is the nature capital as well as the sardine capital of the island. The economy in based upon agriculture, the nature tourism from vistitors who come to see the many birds who stop in the marshes on their way to and from northern Europe, and from the sardines and other fish and seafood that comes from the rich and beautiful bay. The town of Kaloni sits in a lush and enormous valley that borders the bay of Kaloni. This valley is home to many different species of birds and wildflowers and in springtime the hotels are full of bird watchers from all over the world. The bay itself is a marvel to behold. More like an inland sea then a bay, it is ringed by mountains on two sides and the fertile valley on another opposite a small channel that leads to the sea. It is full of sardines which Lesvos and Kaloni in particular are famous for. It is said that the sardines from the bay are the healthiest in the world due to their high mineral content. The reason as explained to me is because the rains wash the oil from the olive groves into the bay. Whether this is true I leave others to debate but I will testify that Sardines from Kaloni are delicious, grilled, fried or eaten as Sardeles Pastes . Even in the main market in Athens you can hear the fish merchants calling out proudly that their sardines come from kaloni and in the summer trucks travel all over the island selling the magical miracle sardines. The town of Skala Kaloni is both the port, beach and tourist center of Kaloni. The water is shallow and almost never rough and the beaches are very sandy. There are several restaurants along the shore and in the town square, along with supermarkets, hotels, tourist shops etc. The port, which is home to the island's sardine fishing fleet is colorful and active but to see them unloading their catch you have to get there pretty early in the morning. If you do you can buy a container of sardeles pastes.Perhaps because of the surrounding mountains the bay of Kaloni is a great place for wind-surfing and Manolis of the wonderful Medusa restaurant right on the beach is an expert, though during the tourist season he really has to fight for time to pursue his passion. But if you are a windsurfer or want to become one than Manolis is certainly the person to talk to. T he above photo is taken on a rare rainy day in July when we arrived just in time to help Manolis put his boat into the water by sliding it down on pieces of wood placed perpindicular to the keel of the boat like railroad ties. One of the most well known craftsmen of the village, at least to fishermen and sailors is Panagiotis Psaradellis, the master boat builder of the village. His shop is in the harbor, just next to the Medusa restaurant and he can be seen working there daily, either restoring an old caique or building a new one. He uses simple hand tools, though is not against using power tools when it makes his job easier. For someone who wants to learn the vanishing art of wooden boat building there is probably no better teacher than Panagiotis and an afternoon watching him hard at work is time well spent. Kaloni itself is the crossroads for the western and northern villages of the island. It is a regional capital and has a great deal of commercial and cultural activity. There are shops of all sorts, supermarkets, a computer store, electronics stores, fruit markets and a street lined with cafeneons. In the market street of Ermou, off the main street, there is an excellent CD and record store where the woman will let you sample the CD's before buying. There is a computer shop called Delimitrou where you can buy software and even get help if you are suffering from laptop problems. The EIPMOS bookstore which has books in English and other languages as well as Greek, of course, is centrally located on Hania. You can buy a copy of Wild Birding in Lesvoshere. There is a camping and fishing shop on the road to Mytilini right outside the town where you can buy a mask, snorkel, flippers and anything you need to enjoy the sea. In the winter the town is lively with music and nightlife which many young people come down from the mountain villages to enjoy. Usually around the forst weekend in August they celebrate the Skala Kaloni Sardine Festivalin the village square featuring free ouzo and sardines, a live band and traditional dancers. Along the coast are marshes filled with wildlife. The fish practically leap out of the sea and standing on the shore looking out at a bay so large that the entire island of Sifnos could fit in it, gives one a feeling of awe. Walking along the bay past the tidal pools full of crabs and fish, is very enjoyable in the spring and early summer, when a vast assortment of wild birds can be seen. Bring binoculars if you have any. The valley gets very hot in late July and August, when most people stick to the beach or the hotel pool. But for those who venture out this is the time to see the flamingos. I know it is hard to tell these are flamingos from this picture but trust me that they are. An enjoyable car journey is to follow the coast on either side of Kaloni. On the western shore of the bay is the village of Parakila and below it in a field is the ruins of an old mosque. Nearby there is a lovely old stone road and bridge that crosses a stream. There are a few tavernas along the coast and some places to swim. The tiny town of Apothikes is no more then a cafeneon and some houses at the mouth of the bay, but it is a beautiful place to stop. If you continue on the coastal road past Agra and Mesotopos you will eventually find yourself in Eressos . There is a small road that goes from Agra and will connect you with Xidera and Pterounda but unless you have a jeep I don't advise taking this route. If you follow the southeast coast of the bay you will see an interesting variety of landscapes, from salt plains and marshes to forest and streams. You will eventually wind up in Skala Polichnitou, a wonderful place to stop for lunch (sardines of course) with a small harbor full of fishing boats. If you go inland from here you can make a visit to thethermal springs , the hottest in Europe in the main town of Polychnitou. From there you can take a swim at the beach ofVaterathat stretches for miles, or drive through pine forests and Alps-like terrain until you get to Agiassos , the spiritual capital of the island and one of the most beautiful villages in all of Greece. If you follow the coast beyond Skala Polychnitou you will come to the resort village of Nifida just before the mouth of the bay of Kaloni. There are several tavernas here and a long beach. For shell collectors try the coast between Skamoudi and Achladeri. They say there is a sunken city here and if you swim or have a small boat you can actually see the streets and the roofs of houses. Within the valley of Kaloni there are plenty of places to visit, not least among them the town of Agia Paraskevis , not only one of the wealthiest on the island but in all of Greece. The town is known for a festival in late June in which horses are raced through the streets past cafes full of people drinking and eating while bands play live Greek music at nearly every restaurant. If you join the festivities try to remain alert. Things can get pretty wild with horses riding into the cafeneons. Some say the riders give them ouzo just to liven things up a bit. 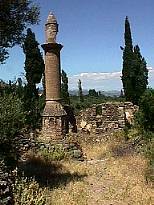 Nearby are the ruins of an Achaean and classical temple to Apollo at Klopedi and the Kremasti bridge, made entirely of stone.Kaloni was one of the most flourishing towns of medieval Lesvos. Ruins have been found in the area from ancient, Byzantine and medieval times. The nearby sanctuary at Mesa (photo) is worth a visit. The Limonos Monastery, consecrated to the Archangel Michael is open to visitors. It was built in 1523 and during the Turkish occupation, was the intellectual center of the island. The library contains approximately 5000 books from 1502 until the present and manuscripts, patriarchal bulls, sultanate firmans, official decisions and other documents dating as far back as the 9th century. There are countless pieces of jewelry, holy relics and sacred icons. The festival day for the monastery is the eighth of October. When the Limnonas monastery has its festivals the whole area is full of people selling religious items and other things that are not religious in nature. Don't miss the Medusa restaurant in Skala Kaloni, perhaps the best in all of Lesvos. Owned by Manolis and his wife from Holland, Dorien and featuring a cast of dozens of family members, you can count on good service and the best and freshest fish on the island. The restaurant has its own fishing boat that goes out every day. During the season they have the best sardeles pastes. They are so good they are served plain but I usually ask for a little olive oil, and lemon to go on them. If you are driving from Molyvos or Eressos and have to return then go easy on the ouzo. But if you are staying in Kaloni then there is no reason to hold back and an afternoon and evening at the Medusa is a good enough reason to stay overnight in Skala Kaloni. Of course if the idea of raw sardines does not excite you then you can order them grilled or deep-fried like in the pucture. There are a number of hotels and rooms in Skala Kaloni including several that are popular with bird watchers. You can ask which ones are the most popular by contacting Sappho Travel or Eressos Travel. And a visit to Skala Kaloni is not complete unless you have met their pelican who spends his time wandering among the sun beds on the beach or relaxing in the shade. Like several villages in Lesvos, Skala Kaloni has adopted a pelican or perhaps it is the Pelican who has adopted Skala Kaloni. They come from North Africa and some of them decide that instead of making the long journey back, to take the easy life in Lesvos where fish is plentiful and food is cheap, much like many of the tourists who decide to make their home on the island do. Ο κόλπος της Καλλονής και ειδικότερα στην πόλη παραλία της Σκάλας Καλλονής είναι η πρωτεύουσα της φύσης, καθώς και η πρωτεύουσα της σαρδέλας του νησιού. Η οικονομία στηρίζεται στη γεωργία, τον τουρισμό φύσης από vistitors που έρχονται να δουν τα πολλά πουλιά που σταματούν στα έλη στο δρόμο τους προς και από τη Βόρεια Ευρώπη, καθώς και από τις σαρδέλες και άλλα ψάρια και τα θαλασσινά που προέρχεται από το πλούσιο και όμορφο κόλπο . Η πόλη της Καλλονής βρίσκεται σε ένα καταπράσινο και τεράστια κοιλάδα που συνορεύει με το κόλπο της Καλλονής. Αυτή η κοιλάδα είναι το σπίτι σε πολλά διαφορετικά είδη πουλιών και αγριολούλουδων και την άνοιξη, τα ξενοδοχεία είναι γεμάτα παρατηρητές πουλιών από όλο τον κόσμο. Ο κόλπος είναι ένα θαύμα στο behold. Περισσότερο σαν μια εσωτερική θάλασσα τότε ένα κόλπο, δακτυλιώθηκε από βουνά και στις δύο πλευρές και την εύφορη κοιλάδα, στο άλλο απέναντι από ένα μικρό κανάλι που οδηγεί στη θάλασσα. Είναι γεμάτη από σαρδέλες που Καλλονής Λέσβου και συγκεκριμένα είναι διάσημη για. Λέγεται ότι οι σαρδέλες από τον κόλπο είναι η πιο υγιεινή στον κόσμο, λόγω της υψηλής περιεκτικότητα σε ανόργανα άλατα τους. Ο λόγος, όπως μου εξήγησε είναι, γιατί οι βροχές πλύνετε το λάδι από τους ελαιώνες στο κόλπο. Είτε αυτό είναι αλήθεια αφήνω άλλους να συζητήσουμε, αλλά θα μαρτυρούν ότι σαρδέλες Καλλονής είναι νόστιμα, ψητά, τηγανητά ή τρώγονται σαν Σαρδέλες Πάστες. Ακόμη και στην κύρια αγορά στην Αθήνα μπορείτε να ακούσετε τα εμπόρους ψαριών φωνάζει περήφανα ότι σαρδέλες τους προέρχονται από την Καλλονή και στα φορτηγά καλοκαίρι ταξιδεύουν σε όλο το νησί που πωλούν τα μαγικά σαρδέλες θαύμα. Η πόλη της Σκάλας Καλλονής είναι και το λιμάνι, η παραλία και τουριστικό κέντρο της Καλλονής. Τα νερά είναι ρηχά και σχεδόν ποτέ δεν τραχύ και οι παραλίες είναι πολύ άμμο. Υπάρχουν πολλά εστιατόρια κατά μήκος της ακτής και στην πλατεία της πόλης, μαζί με τα σούπερ μάρκετ, ξενοδοχεία, τουριστικά καταστήματα κλπ. Το λιμάνι, το οποίο είναι το σπίτι σε σαρδέλας ο στόλος του νησιού αλιεία είναι πολύχρωμο και ενεργό, αλλά να τους δείτε ζωντανά την εκφόρτωση των αλιευμάτων τους, θα πρέπει να πάρετε υπάρχουν αρκετά νωρίς το πρωί. Αν το κάνετε, μπορείτε να αγοράσετε ένα δοχείο Σαρδέλες Πάστες. Ίσως επειδή στα γύρω βουνά ο κόλπος της Καλλονής είναι ένα εξαιρετικό μέρος για wind-surfing και ο Μανώλης από την υπέροχη δικαιώματος εστιατόριο Μέδουσα στην παραλία είναι ειδικός, αν και κατά τη διάρκεια της τουριστικής περιόδου που έχει πραγματικά να πολεμήσουν για το χρόνο για να ακολουθήσει το πάθος του. Αλλά αν είστε σέρφερ ή θέλετε να γίνετε ένα από Μανώλης είναι σίγουρα το πρόσωπο για να μιλήσει. Τ ο παραπάνω φωτογραφία έχει ληφθεί σε ένα σπάνιο βροχερή ημέρα τον Ιούλιο, όταν φτάσαμε ακριβώς στην ώρα για να βοηθήσει Μανώλης βάλει τη βάρκα του μέσα στο νερό με την ολίσθηση προς τα κάτω σε κομμάτια ξύλου τοποθετείται perpindicular στην καρίνα του σκάφους, όπως οι δεσμοί σιδηροδρόμου. Ένα από τα πιο γνωστά τεχνίτες του χωριού, τουλάχιστον για τους αλιείς και τους ναύτες είναι ο Παναγιώτης Ψαραδέλλης, ο οικοδόμος του πλοιάρχου του χωριού. Το μαγαζί του είναι στο λιμάνι, ακριβώς δίπλα στο εστιατόριο Μέδουσα και ο ίδιος μπορεί να δει εργάζονται εκεί καθημερινά, είτε αποκατάσταση της ένα παλιό καΐκι ή την κατασκευή ενός νέου. Χρησιμοποιεί απλά εργαλεία χειρός, αν και δεν είναι κατά τη χρήση ηλεκτρικών εργαλείων, όταν κάνει τη δουλειά του πιο εύκολη. Για κάποιον που θέλει να μάθει την τέχνη της φυγής ξύλινο κτίριο σκάφος μάλλον δεν υπάρχει καλύτερος δάσκαλος από την Παναγιώτης και ένα απόγευμα βλέποντας τον σκληρά κατά την εργασία είναι ο χρόνος που ξοδεύονται καλά. Καλλονή η ίδια είναι το σταυροδρόμι για τις δυτικές και βόρειες χωριά του νησιού. Πρόκειται για μια περιφερειακή πρωτεύουσα και έχει μεγάλη εμπορική και πολιτιστική δραστηριότητα. Υπάρχουν καταστήματα όλων των ειδών, σούπερ μάρκετ, ένα κατάστημα υπολογιστών, ηλεκτρονικά καταστήματα, αγορές φρούτων και έναν δρόμο με cafeneons. Στο δρόμο της αγοράς της Ερμού, δίπλα στον κεντρικό δρόμο, υπάρχει μια εξαιρετική CD και δισκάδικο, όπου η γυναίκα θα σας αφήσει να δοκιμάσετε το CD πριν από την αγορά. Υπάρχει ένα κατάστημα ηλεκτρονικών υπολογιστών που ονομάζεται Δελημήτρου, όπου μπορείτε να αγοράσετε το λογισμικό, ακόμη και να βοηθήσει εάν πάσχετε από προβλήματα laptop. Το βιβλιοπωλείο EIPMOS που έχει βιβλία στην αγγλική και σε άλλες γλώσσες, καθώς και ελληνικό, φυσικά, βρίσκεται σε κεντρική τοποθεσία Χανιά. Μπορείτε να αγοράσετε ένα αντίγραφο της άγριας Κυνήγι στη Λέσβο εδώ. Υπάρχει ένα κάμπινγκ και το κατάστημα της αλιείας στο δρόμο προς Μυτιλήνη ακριβώς έξω από την πόλη, όπου μπορείτε να αγοράσετε μια μάσκα, αναπνευστήρα, βατραχοπέδιλα και ό, τι χρειάζεστε για να απολαύσετε τη θάλασσα. Το χειμώνα η πόλη είναι ζωντανή με τη μουσική και τη νυχτερινή ζωή που πολλοί νέοι άνθρωποι έρχονται κάτω από τα ορεινά χωριά για να απολαύσετε. Συνήθως γύρω από το Forst Σαββατοκύριακο του Αυγούστου θα γιορτάσει την Σκάλα Καλλονής Γιορτή Σαρδέλας στην πλατεία του χωριού με δωρεάν ούζο και οι σαρδέλες, μια ζωντανή ορχήστρα και παραδοσιακούς χορευτές. Κατά μήκος της ακτής είναι έλη γεμίζουν με την άγρια φύση. Το ψάρι σχεδόν άλμα έξω από τη θάλασσα και στέκεται στην ακτή με θέα σε έναν όρμο τόσο μεγάλη που ολόκληρο το νησί της Σίφνου θα μπορούσε να χωρέσει σε αυτό, δίνει μια αίσθηση δέους. Περπατώντας κατά μήκος του κόλπου παρελθόν τα παλιρροιακά πισίνες γεμάτες καβούρια και τα ψάρια, είναι πολύ ευχάριστη την άνοιξη και στις αρχές του καλοκαιριού, όταν μια τεράστια ποικιλία των άγριων πτηνών μπορεί να θεωρηθεί. Φέρτε κιάλια, αν έχετε. Η κοιλάδα παίρνει πολύ καυτό στα τέλη Ιουλίου και τον Αύγουστο, όταν οι περισσότεροι άνθρωποι κολλήσει στην παραλία ή στην πισίνα του ξενοδοχείου. Αλλά για εκείνους που βγείτε έξω αυτή είναι η στιγμή για να δείτε τα φλαμίνγκο. Ξέρω ότι είναι δύσκολο να πει αυτά είναι τα φλαμίνγκο από αυτή την εικόνα, αλλά πιστέψτε με ότι είναι. Ένα απολαυστικό ταξίδι με αυτοκίνητο είναι να ακολουθήσετε την ακτή και στις δύο πλευρές της Καλλονής. Στη δυτική ακτή του κόλπου βρίσκεται το χωριό Παράκοιλα και κάτω από αυτό σε έναν τομέα είναι τα ερείπια ενός παλιού τζαμιού. Σε κοντινή απόσταση υπάρχει ένα υπέροχο παλιό πέτρινο δρόμο και γέφυρα που διασχίζει ένα ρυάκι. Υπάρχουν μερικές ταβέρνες κατά μήκος της ακτής και ορισμένα μέρη για να κολυμπήσετε. Η μικροσκοπική πόλη Αποθήκες είναι όχι περισσότερο από ένα cafeneon και μερικά σπίτια στο στόμιο του κόλπου, αλλά είναι ένα όμορφο μέρος για να σταματήσει. Αν συνεχίσετε στον παραλιακό δρόμο παρελθόν Agra και Μεσότοπος θα βρεθείτε τελικά στην Ερεσό. Υπάρχει ένας μικρός δρόμος που πηγαίνει από την Άγρα και θα σας συνδέσει με Xidera και Πτερούντα αλλά αν δεν έχετε ένα τζιπ εγώ δεν συμβουλεύει τη λήψη αυτής της οδού. Αν ακολουθήσετε τη νοτιοανατολική ακτή του κόλπου θα δείτε μια ενδιαφέρουσα ποικιλία των τοπίων, από πεδιάδες και αλατούχα έλη σε δάσος και ρέματα. Μπορείτε τελικά θα καταλήξει στο Σκάλα Πολιχνίτου, ένα υπέροχο μέρος για να σταματήσει για μεσημεριανό γεύμα (σαρδέλες, φυσικά) με ένα μικρό λιμανάκι γεμάτο από ψαρόβαρκες. Αν πάει στην ενδοχώρα από εδώ μπορείτε να κάνετε μια επίσκεψη στα ιαματικά λουτρά, το πιο hot στην Ευρώπη, στην κύρια πόλη του Πολυχνίτου. Από εκεί μπορείτε να πάρετε μια βουτιά στην παραλία των Βατερών, που εκτείνεται για χιλιόμετρα, ή να οδηγήσετε μέσα από δάση και των Άλπεων, όπως το έδαφος μέχρι να φτάσετε στην Αγιάσο, η πνευματική πρωτεύουσα του νησιού και ένα από τα πιο όμορφα χωριά σε όλη την Ελλάδα . Αν ακολουθήσετε την ακτή πέρα από Σκάλα Πολυχνίτου θα έρθει στο χωριό θέρετρο της Νυφίδας λίγο πριν από το στόμιο του κόλπου της Καλλονής. Υπάρχουν αρκετές ταβέρνες και μια μεγάλη παραλία. Για τους συλλέκτες κέλυφος δοκιμάστε την ακτή μεταξύ Skamoudi και Αχλαδερή. Λένε ότι υπάρχει μια βυθισμένη πόλη εδώ και αν μπορείτε να κολυμπήσετε ή να έχετε ένα μικρό σκάφος μπορείτε να δείτε πραγματικά τους δρόμους και τις στέγες των σπιτιών. Μέσα στην κοιλάδα της Καλλονής υπάρχουν πολλά μέρη για να επισκεφτείτε, όχι τουλάχιστον μεταξύ τους την πόλη της Αγίας Παρασκευής, δεν είναι μόνο μια από τις πλουσιότερες στο νησί, αλλά σε όλη την Ελλάδα. Η πόλη είναι γνωστή για ένα φεστιβάλ στα τέλη Ιουνίου, όπου τα άλογα έτρεξαν στους δρόμους παρελθόν καφέ γεμάτα ανθρώπους να πίνουν και να τρώνε, ενώ μπάντες παίζουν ζωντανή ελληνική μουσική σχεδόν σε κάθε εστιατόριο. Εάν συμμετάσχουν στους εορτασμούς προσπαθούν να παραμένει σε επιφυλακή. Τα πράγματα μπορεί να πάρει αρκετά άγρια με άλογα ιππασίας στα cafeneons. Μερικοί λένε ότι οι αναβάτες τους δώσει ούζο μόνο για να ζωντανέψετε τα πράγματα επάνω ένα κομμάτι. Σε κοντινή απόσταση βρίσκονται τα ερείπια του Αχαιού και κλασικός ναός του Απόλλωνα στην Κλοπεδή και την Κρεμαστή γέφυρα, κατασκευασμένο εξ ολοκλήρου από πέτρα. Καλλονή ήταν μία από τις πιο ακμάζουσες πόλεις της μεσαιωνικής Λέσβου. Τα ερείπια έχουν βρεθεί στην περιοχή από την αρχαία, βυζαντινή και μεσαιωνική εποχή. Το κοντινό ιερό Mesa (φωτογραφία), αξίζει μια επίσκεψη. Η Μονή Λειμώνος, αφιερωμένη στον Αρχάγγελο Μιχαήλ είναι ανοιχτό για τους επισκέπτες. Χτίστηκε το 1523 και κατά τη διάρκεια της Τουρκοκρατίας, ήταν το πνευματικό κέντρο του νησιού. Η βιβλιοθήκη περιέχει περίπου 5000 βιβλία από το 1502 μέχρι σήμερα και χειρόγραφα, πατριαρχική ταύρους, φιρμάνια σουλτανάτο, επίσημες αποφάσεις και άλλα έγγραφα που χρονολογούνται από τον 9ο αιώνα. Υπάρχουν αμέτρητα κομμάτια του κοσμήματος, λείψανα αγίων και ιερών εικόνων. Την ημέρα της γιορτής για το μοναστήρι είναι το όγδοο του Οκτωβρίου. Όταν το μοναστήρι Λιμνώνας έχει φεστιβάλ της ολόκληρη η περιοχή είναι γεμάτη από ανθρώπους που πωλούν θρησκευτικά αντικείμενα και άλλα πράγματα που δεν είναι θρησκευτικής φύσης. Μην παραλείψετε να επισκεφθείτε το εστιατόριο Μέδουσα στη Σκάλα Καλλονής, ίσως το καλύτερο σε όλες της Λέσβου. Ανήκει στον Μανώλη και η σύζυγός του από την Ολλανδία, Dorien και διαθέτει ένα cast από δεκάδες των μελών της οικογένειας, μπορείτε να υπολογίζετε σε καλή εξυπηρέτηση και το καλύτερο και πιο φρέσκα ψάρια στο νησί. Το εστιατόριο έχει το δικό του αλιευτικό σκάφος του, που βγαίνει κάθε μέρα. Κατά τη διάρκεια της σεζόν έχουν τις καλύτερες πάστες Sardeles. Είναι τόσο καλό που σερβίρονται απλό, αλλά ζητώ συνήθως για λίγο ελαιόλαδο και λεμόνι για να πάει σε αυτούς. Αν είστε οδήγηση από το Μόλυβο ή Ερεσσού και πρέπει να επιστρέψουν στη συνέχεια να πάει εύκολο για το ούζο. Αλλά αν μένετε στην Καλλονή τότε δεν υπάρχει κανένας λόγος για να κρατήσει πίσω και το απόγευμα και το βράδυ στο Medusa είναι ένα αρκετά καλό λόγο να διανυκτερεύσει στη Σκάλα Καλλονής. Φυσικά, αν η ιδέα των πρώτων σαρδέλες δεν σας ενθουσιάσει, τότε μπορείτε να τα παραγγείλετε ψητά ή τηγανητά, όπως στην pucture. Υπάρχουν μια σειρά από ξενοδοχεία και δωμάτια στη Σκάλα Καλλονής συμπεριλαμβανομένων πολλών που είναι δημοφιλείς με τους παρατηρητές πουλιών. Μπορείτε να ρωτήσετε ποια είναι τα πιο δημοφιλή σε επαφή με Sappho Travel ή Ερεσού Travel. Και μια επίσκεψη στην Σκάλα Καλλονής δεν είναι πλήρες αν έχετε συναντήσει πελεκάνος τους που ξοδεύει το χρόνο του να περιφέρεται ανάμεσα στις ξαπλώστρες στην παραλία ή να χαλαρώσετε στη σκιά. Όπως πολλά χωριά της Λέσβου, Σκάλα Καλλονής έχει υιοθετήσει ένα πελεκάνο ή ίσως είναι ο πελεκάνος που έχει υιοθετήσει Σκάλα Καλλονής. Έρχονται από τη Βόρεια Αφρική και κάποια από αυτά να αποφασίσει ότι αντί να κάνει το μακρύ ταξίδι της επιστροφής, για να λάβει την εύκολη ζωή στη Λέσβο όπου τα ψάρια είναι άφθονα και η τροφή είναι φθηνή, σαν πολλούς από τους τουρίστες που αποφασίζουν να κάνουν το σπίτι τους στο νησί κάνει.